AIR CTI enables you to suit the tire pressure to the load, the road, and the conditions you are driving in. You achieve better traction, better tire life and enjoy a better ride, whilst having greater control over braking, steering and speed. This all adds up to improved safety, lower costs, reduced down time, higher profits and improved job scheduling. The ability to control your tire pressure will maximise your vehicle life and your tire life. AIR CTI is extremely effective in all terrain conditions, including on road and off road conditions, from sand, gravel and mud, to bitumen. •Just push the button on the dash to adjust the tire pressure to suit your needs. •The pressure adjusts to the set pressure, and is maintained at that pressure. 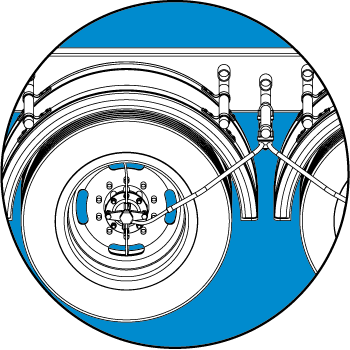 •If a puncture occurs, a visual and audible warning warns the driver, then automatically adds air to keep the tires inflated, up to the capacity of the truck compressor. 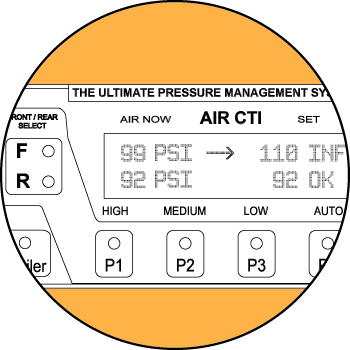 •On start up, AIR CTI automatically selects the highest pressure, as a safety feature, ensuring safe operations. A dash mounted controller allows for quick and easy switching between pre-set pressures. Pre-set pressures can be adjusted on the fly with a simple press of a button. Inbuilt safety measures are also built in to ensure the driver is always aware of any issue. Air supply is connected to an inflate and self-draining filter assembler. 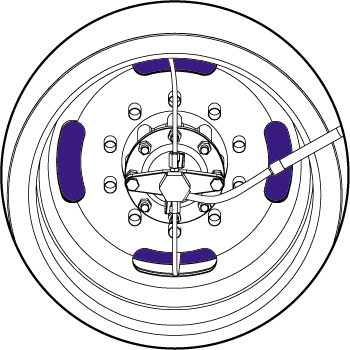 This assembly, which is generally located behind the cabin, regulates the supply of air to the Isolator assembly, which in turn regulates the tire air pressure. The self-draining water trap/filter removes water and any contamination, improving reliability. 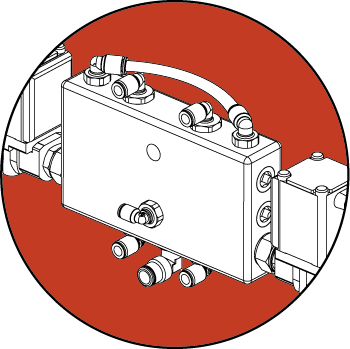 The unique automatic Isolator valve stops cross pumpingstops cross pumping, and limits air loss from other tires, if a tire or other componant is damaged. This is a major safety feature not found elsewhere. The isolator allows for instant isolation of any wheel set from the other wheels. The isolator also increases sensitivity if a puncture occurs, improving the information the driver can see, providing added safety and peace of mind. Super tough heat moulded, Snizentite drop pipes fit nice and close to the tires, supplying air pressure to the rotator glands and then to each tire, via compact valves, and unique self healing quick connect fittings, making tire changes even easier. 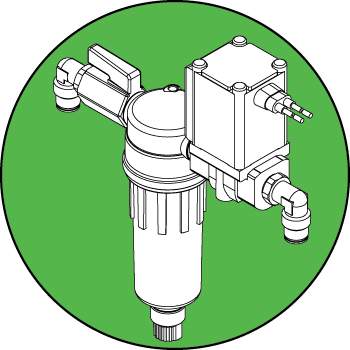 AIR CTI rotators (rotating glands) are the shortest, most robust, and best sealed rotator on the planet. Tough fiber reinforced high strength plastic eliminates corrosion and electrolysis. Large C2 quality bearings ensure long life. Three levels of anti contamination sealing guarantee a long, long life. USA made tire hoses are the best we can find. These are 'cut to length' to ensure a great fit. © Copyright Chet's Professional Services pty ltd. All rights reserved and held by AIR CTI, Smart Trucks and other orignal owners. All information is subject to change at any point without warning. All statistics of products and savings are set on standard use and personal result may change depending on use.